Fatgirl Hedonist: Burger Brawl Ticket Giveaway! 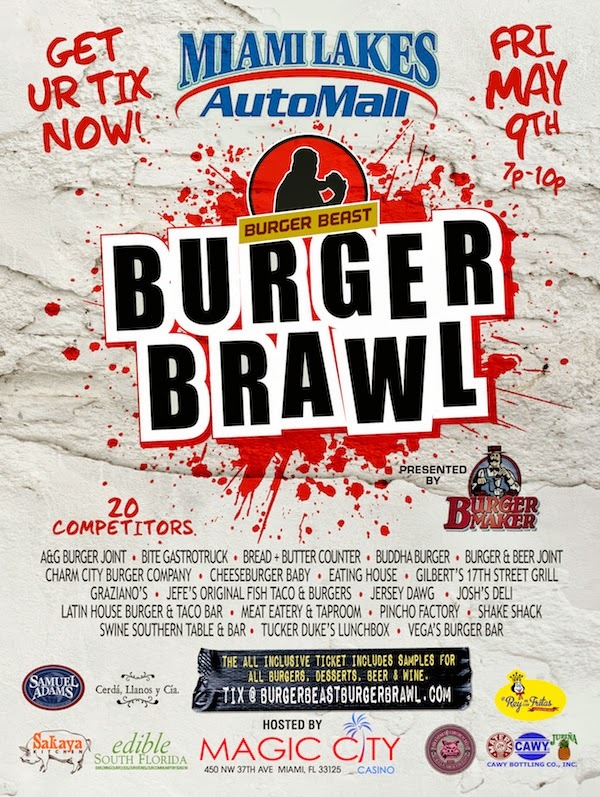 As some of you may already know, Burger Beast, is hosting a pretty epic burger event on May 9, 2014 called The Burger Brawl. Twenty local restaurants will be competing for the title of Best Burger in South Florida and attendants will get to sample all 20 burgers. Yep, you read that right. In addition to twenty burger joints, there will also be Sakaya Kitchen setting up a tater tot bar, Cuban Fritas from El Rey De Las Fritas, dessert from HipPOPs Handcrafted Gelato Bars, Azucar Ice Cream Company, Marlie’s Delights, and Sugar Yummy Mama. Need something to wash all of that food down? BB has you covered with beer from Samuel Adams, Jupiña, Materva and wine from Cerdà, Llanos y Cià. Cost of admission to this gluttonous burger heaven is $50 and is inclusive of all the food & drinks I just mentioned. A really amazing deal, if you ask me and if you use the discount code 'FGHLOVESBB" you'll get $10 off. Now if you're like a lot of people and are holding out for tickets to the Burger Brawl to show up on Groupon or Living Social for half off, te jodiste. I can confirm that tickets to this event will NOT be sold through any other outlets. However, I've gotten my little Hialeah hands on a pair of tickets to give away to one lucky winner along with a new Burger Beast t-shirt. The lucky winner will be announced this Saturday, April 12, 2014! I hope i win! I'm dying to try all the different burgers and delicious treats! In other words... help me get happy-fat! :) Good luck to everyone! I hope i win! Those burgers will be BOMB! Please let me get happy-fat! :) Good luck to everyone participating!!! Thank you for getting your hands on these amazing tickets for a giveaway, you're BOMB too! I hope I finally win a contest. This sounds like a fantastic prize. hope i win! hoping to go there and support all those awesome trucks! thank you for this giveaway!! !